What research is being done to try to prevent Alzheimer’s disease? The research focus now is turning to prevention trials, and a number of studies are underway to test the effectiveness of various therapies in people without symptoms or who have only slight memory problems. Under scrutiny in these studies are further examination of estrogen and studies of various classes of anti-inflammatory drugs and antioxidants. The first large-scale Alzheimer’s disease prevention trial, sponsored by the NIH, is comparing the effects of vitamin E, an antioxidant, and one of the drugs currently approved for Alzheimer’s, donepezil (brand name Aricept), in preventing the development of the disease in people diagnosed with mild cognitive impairment, or MCI, a population at high risk. Ongoing trials are also examining the effectiveness of naproxen and celecoxib (anti-inflammatory drugs) in reducing Alzheimer’s risk in persons with a family history of dementia, the effect of estrogen replacement therapy in preventing Alzheimer’s in women with a family history of the disease, and whether treatment with a variety of agents, such as aspirin, vitamin E, antioxidants, or combined folate/B6/B12 supplementation can prevent older women from developing age-related memory impairment or Alzheimer’s. As scientists test these currently available medications, the next generation of drugs is being developed, targeting specific abnormal cellular pathways uncovered by recent discoveries, including plaque and tangle formation and death of brain cells. Prevention trials are among the most costly of research projects, but, if successful, the payoff in terms of reduced disease and disability will be significant. What is the NIA Alzheimer’s Disease Prevention Initiative? The Alzheimer’s Prevention Initiative is an intensive, coordinated effort spearheaded by the National Institute on Aging (NIA) to accelerate basic research and help translate basic research findings into the development of novel compounds that delay or slow the progress of Alzheimer’s or to prevent it entirely. Potentially promising strategies are being identified, based on new information about the initial stages and events in the brain that lead to Alzheimer’s, as well as data from studies of genetic and environmental risk factors. To follow up on these leads, NIA has implemented a five-year research initiative to speed the development of vaccine and other novel approaches for preventing AD. Another research initiative will examine changes in immune function with age, including the response to different vaccination protocols. Along with the prevention initiative, other studies will continue to look at the many similarities in the biological mechanisms underlying neurodegenerative diseases such as Alzheimer’s, Parkinson’s disease, and other dementias, and will help to characterize age-related change in the normal, healthy brain. Does estrogen replacement therapy prevent Alzheimer’s? A few large studies have investigated whether taking estrogen replacement therapy may help slow the progression of Alzheimer’s in women with the disease. So far, the largest and best-designed studies have found that estrogen does NOT have a beneficial effect on women who already have Alzheimer’s. However, these studies do not answer the question of whether normally aging women who take estrogen after menopause will be protected from developing Alzheimer’s or age-related cognitive decline. Two gold-standard studies published in May 2003, part of the ongoing Women’s Health Initiative Memory Study, found that the widely popular duo of estrogen and progestin (Prempro) did nothing to ward off Alzheimer’s when the hormones were begun in women starting at age 65 and older. In one of the reports, the risk of dementia actually slightly increased in women who took the hormones. The findings also showed that combination hormone replacement did not protect against a milder form of memory loss called mild cognitive impairment (MCI). MCI is characterized by memory lapses that can accompany aging and, in some cases, eventually lead to Alzheimer’s. These findings are only one additional component to be weighed when women are deciding whether to start or continue on hormone replacement therapy. The study, for example, did not look at younger women who were taking these drugs, some of whom may only take it for a year or two. It is also important to note that the possibility remains that estrogen-only replacement might afford protection against Alzheimer’s, especially if administered at or around the onset of menopause rather than many years later. However, unopposed estrogen replacement is only available for women who have had hysterectomies. If these women are indeed found to have a diminished risk of Alzheimer’s, that will fuel the search for brain-specific estrogen-like molecules that can protect the brain but spare the side effects on the reproductive tissues. Additional study on possible preventive measures during normal aging is now under way. One multi-site clinical trial, which is supported by the National Institute on Aging, seeks to determine whether the use of estrogen in cognitively normal older women with a family history of Alzheimer’s (and who therefore have two to three times the risk of developing the disease) may prevent its development. Can anti-inflammatory drugs prevent Alzheimer’s disease? One of the hallmarks of Alzheimer’s disease is inflammation in the brain, but whether it is a cause or an effect of the disease is not yet known. Epidemiologic evidence strongly suggests that anti-inflammatory agents, such as prednisone (a steroid) and the popular pain relievers known as non-steroidal anti-inflammatory drugs (NSAIDs), including ibuprofen and indomethacin are associated with a decreased risk of Alzheimer’s. Studies in animal models of Alzheimer’s suggest that an NSAID can limit plaque production in the mouse brain. However, results of a study that compared the effects of prednisone versus a placebo (inactive pill) on people who had been diagnosed with Alzheimer’s found no difference in cognitive decline between the prednisone and placebo treatment groups. Thus, a low-dose regimen of prednisone does not seem to be useful in treating Alzheimer’s disease. A report in the Journal of the American Medical Association found that two popular NSAIDs, naproxen (Aleve) and the prescription arthritis painkiller rofecoxib (Vioxx), did nothing to slow the progression of Alzheimer’s disease in people with mild to moderate decline. However, previous studies suggest that NSAIDs may help to prevent Alzhiemer’s disease. There is evidence that these or related drugs can reduce the risk of developing the illness in the first place if given to people before the onset of symptoms. A large study that followed nearly 7,000 patients for an average of 6.8 years found that people who did not use NSAIDs had a nearly five times greater risk of developing the disease than those who used NSAIDs long-term (24 months or more of cumulative use). People who used NSAIDs for more than one but less than 24 months also had a decreased risk of developing Alzheimer’s. The risk did not vary according to age. These data provide perhaps the most convincing evidence to date that NSAIDs may be useful in the prevention of Alzheimer’s disease. 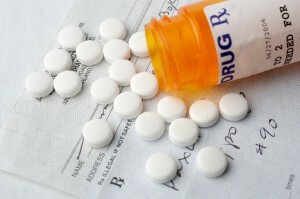 However, a large government study designed to test whether the anti-inflammatory drugs naproxen (an NSAID sold as Aleve) or Celebrex (a pain reliever related to Vioxx and known as a COX-2 inhibitor) was halted after researchers noted that these drugs may cause an increased risk of heart attacks and strokes. Researchers had long known that NSAIDs are associated with gastrointestinal problems, including bleeding ulcers and with kidney problems, but the heart complications present an additional potential danger. These drugs must be used with caution, and only under a doctor’s supervision. More research is needed on the safety of the various anti-inflammatory drugs and their possible benefits for treating or preventing Alzheimer’s disease. It is possible that those with Alzheimer’s who take different anti-inflammatories or different doses might show benefits. More studies of NSAIDs are under way. Drugs that work against toxic amyloid, the substance that contributes to plaque buildup and that is thought to be key to Alzheimer’s, are also under investigation. Can taking cholesterol-lowering drugs prevent Alzheimer’s disease? Scientific evidence is growing for a link between the use of a class of cholesterol-lowering drugs called statins and reduced risk of Alzheimer’s disease. Statins, which are prescribed to millions of Americans for lowering blood levels of low-density lipoprotein (LDL) cholesterol – the “bad” cholesterol – have been the subject of intense focus in Alzheimer’s research ever since a series of epidemiologic studies found that people who took them have a lower incidence of Alzheimer’s. Researchers at Boston University School of Medicine found that people taking statins reduced their risk of developing Alzheimer’s by 29 percent. The study, the largest to date on this subject, tracked more than 2,300 participants and included African-Americans. Alzheimer’s incidence was reduced equally in both whites and African-Americans. A team at St. George’s Hospital Medical School in London found that using statins to reduce cholesterol levels dramatically lowered the production of beta amyloid in laboratory experiments. Beta amyloid is a protein that abnormally accumulates in the brain in Alzheimer’s disease. The group has also shown that raising cholesterol levels increases beta amyloid production. A Tokyo-based research group found similar results, and identified a specific pathway through which statins may exert their effect on beta amyloid. Scientists at Georgetown University found that high cholesterol levels increase the rate at which beta amyloid breaks off from its “parent” protein and accumulates into the plaques found in Alzheimer’s disease. They also showed that high cholesterol increases the production of another protein, called APOE, which contributes to nerve cell toxicity when overproduced. Other scientists are looking at the biochemical effects statins have within the brain. A team at the University of South Florida Health Sciences Center discovered that statins were able to block the toxic effects beta amyloid has on nerve cells, and seemed to act through an anti-inflammatory action. Inflammatory processes are thought to contribute to Alzheimer’s in ways that are not completely understood. A large, prospective clinical trial is currently underway to try to determine conclusively if statins can prevent or delay the onset of Alzheimer’s disease.